Whether you’re best friends with your siblings or you try to refrain from a battle royale every time you’re around each other, there is a reason to celebrate your relationship on National Sibling Day. You don’t have to shower your siblings in gifts on this day though, which will suit your budget. There are a few fun things you can do that will save you some money while allowing you to have fun with the people that you grew up with. So, on April 10, you might want to take some time out of your life to have a bit of fun on this amazing holiday designed just for you and your siblings. Chances are, you’ve probably caught whim of the photo recreations that have been buzzing around the internet lately. This is actually quite simple to do if you choose the right photo. Your best option is to choose a picture with simple props and clothing that can be recreated with ease. Then, all you have to do is recreate the poses you and your siblings had. Once the photo is snapped, you can move on to something else. This is certain to help you have some fun with each other, while allowing you to recall all of the awkward moments you had with each other. If you’re pranksters, then you can swap out the recreation photos with the old photos in your parents’ home, to see how long it takes them to notice. You can also create a book of photo recreations, which are bound to be a laugh when you go over them in the future. Sometimes, life really gets in the way of keeping in touch with family. Thus, you might want to use National Sibling Day as an excuse to pencil in a call to your siblings. If you’re all on social media, then you can always create a group chat so you can see and speak to each other at the same time. This is a good way to catch up with each other while having a little fun. Of course, you can always call one another the old-fashioned way and talk for a bit. If you and your siblings aren’t exactly chatty then send a text their way to let them know you’re thinking about them on National Sibling Day. This should help to improve your relationship and might even spark more contact between everyone. One of the best ways to bond with your siblings is to sit down and have a meal together. You might start by agreeing on a restaurant. However, if you tend to feud often over your options, it might be best to choose a place that is nostalgic to your childhood. If you’d prefer to save some money, then grab some supplies to make one of your favorite childhood meals. You can cook and each together to ensure you have spent some time together. 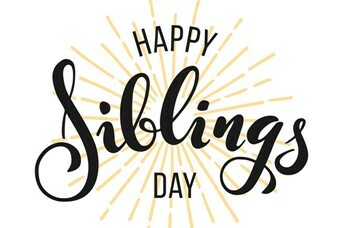 If you’re helping your own children celebrate sibling day then you can cook fun foods that offer a connection between the two of them. This should help make their day special while allowing them to form a closer bond. Nothing says family fun, quite like the iconic game Family Feud. There are so many ways for your siblings to get in on the game with you. You can purchase the board game and bring it home for a fun evening shared together. If you live far apart, then you can download an app and play online together. You might even come up with your own rendition of Family Feud, which can be played whenever you feel like it. This game helps to bring everyone closer together while helping to ease tension. You will be surprised by how much fun you can have while answering questions and teaming up with your ultimate team, your siblings. If you have a big family, then group your siblings as a team and have all of your children work together on an opposing team. This should bring even more fun to the next generation while encouraging them to bond, too. If your family tends to be on the last-minute side of the spectrum, then you will definitely benefit from shopping for Mother’s Day and Father’s Day while celebrating Sibling’s Day. You might make a plan to meet up at the mall or other shopping area to get to work. In order to save some money, everyone can even go in on one gift. This should make the shopping experience a lot more fun and will ensure you don’t have to worry about anything until next year. You might want to make a tradition of doing this, so you won’t forget another parental holiday again. Your parents will certainly love to hear that you’re uniting, which is a gift in itself. If you have children, then you might use this day to have them craft together for holiday gifts. When it comes to siblings, it is often fun to look back on the things you used to do for entertainment. In order to celebrate the holiday, you might want to consider going back to some of your old haunts. For instance, you can meet up at a park you used to frequent. You might even bring your own children to experience the fun you once had at the park. You can also go back in time and watch some of your favorite movies together. Add some of your favorite childhood snacks and drinks to the mix and you’ll be on the right train to nostalgia city. You might even consider sharing traditions you once enjoyed with your siblings. One such example is going out for ice cream together to celebrate getting along. Let’s face it, we don’t always see eye to eye with our siblings. From sibling rivalry to personality differences, you might find a lot of pent up aggression for your sibling at times. Thus, having a battle royale might be one of the best ways to celebrate Siblings Day. You can choose from some of your favorite activities to help you do this too. For instance, if you grew up paintballing then book a session and have some fun. You might also consider a water balloon battle for a cheaper option. This is great for siblings of all ages too, which will add to the fun. Of course, you should always make safety a priority and hug it out when you’re finished blowing off steam. It is often hard to be straight forward when it comes to the nice things about our siblings. So, this holiday you might sit down with a piece of paper and write your sibling a letter mapping out everything you like about them and how they influenced your childhood. You can also do this by simply having a conversation or offering compliments throughout the day. This activity works great for kids too and can even help form a deep bond that will cancel out any fighting they might undergo. Younger children can even draw pictures of their siblings to help breach the gap and show affection. Sharing feelings can be very powerful, so make sure to be open to comments you give and receive. You might not think much of Sibling’s Day, but there are some great deals that might change your mind. Although the holiday isn’t top of the tier and more often than not it gets swept under the rug, you’ might find that there are some hidden gems if you look hard enough. A lot of restaurants love to give BoGo deals for siblings. You might luck out and get extra fries, a free ice cream cone, or even a free cup of coffee. The deals change every year, but you might look around at hints from last year’s deals so you’ll be ready to jump on any deals that might soon be available. This is a great way to cash in on your relationship while saving some money. Eating as a family is one of the most important things that you can do. You don’t have to make it a Special Sibling Meal though. Instead, you can work on sharing some food while catching up with one another. You might even host the dinner at your parent’s home to make it even more special and inclusive. Everyone can work on the same meal by pitching in some of the work, may it be cooking or cleaning. Once the meal is ready, put your devices up, and enjoy one another’s company. You might even consider hosting a picnic or barbeque. As long as you’re eating and bonding, the holiday will certainly be a success. This activity is great for all ages too, so try to make it a heartwarming experience that kids will love to share in the future. Siblings’ Day is the perfect time to celebrate the people that have seen you at your best and worst. Although we may not realize it, they contribute so much to the person we are, which makes them incredibly important. So, don’t let your bond fade. Instead, make sure you enjoy the best Siblings’ Day around with these ten ideas.